Good news for LA Sparks fans – Candace Parker has signed a multi-year contract extension. The Seattle Storm’s training camp roster is complete, with the addition of five signees. Two are from Washington state: Ashley Corral, who just graduated from USC, and Seattle native Jacqua Williams. I thought Corral should have been drafted, and I remember the Williams days at Rainier Beach High School. Good luck to both phenomenal players. Other signees include Lykendra Johnson to the Sky; Jasmine Lee to the Lynx; Aisha Sutherland to the Dream; and Cierra Bravard to the Silver Stars. I SO wish there were two more teams in the league to handle all these talented players. Indiana Fever forward and 2011 MVP Tamika Catchings will be inducted into the Tennessee Sports Hall of Fame. Jerry Finkbeiner is leaving Oral Roberts after 16 years to coach at Utah State. The University of Missouri Kansas City has picked Marsha Frese as their new coach. She’s the sister of Terp coach Brenda Frese. New coach Patricia Bibbs is part of big changes at Grambling. Three players are leaving Oklahoma State. 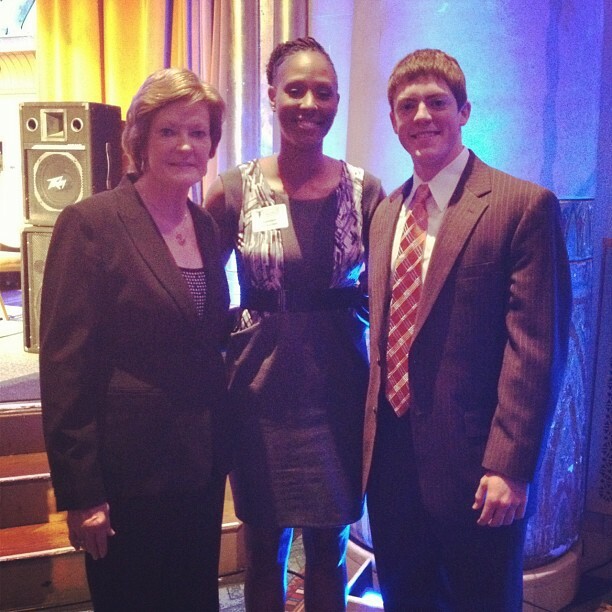 Pat Summitt received the 2012 Coach Wooden Citizenship Cup Award just a short time ago in Atlanta. Click the “Pat Summitt’s legacy” link in the middle of this page to see a great video of the legend, narrated in part by former Lady Vol Michelle Marciniak.